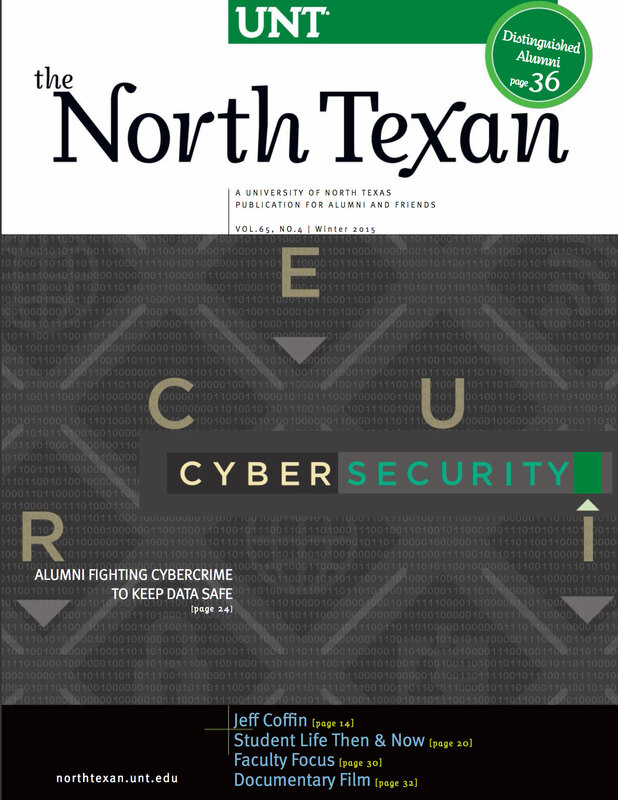 Alumni on the front lines combat dangerous cyberattacks, helping individuals, organizations and companies more effectively keep data safe. Mean Green soccer team makes an appearance in the NCAA postseason tournament. Members of the Class of 1965 gathered for their 50th reunion. Students, alumni and bold dreams shape UNT's legacy and future. Take a look with us and see if you agree that, in some ways, the life of a student is timeless. Alumna's nonprofit is helping Parkinson's patients with speech loss learn to speak up. UNT graduate Amy Bishop uses her love of radio, classic music as reporter News 88.7 in Houston. UNT graduate David Register earns national attention for teaching prison inmates. UNT alum Jeremy Park is working to shift the focus of the business industry. The saxophonist uses fundamentals he honed at UNT as a member of the Dave Matthews Band. UNT celebrates faculty for their extraordinary teaching, scholarly research and community service. Alumni of UNT's documentary studies graduate program are changing lives through their films. UNT honors extraordinary alumni for their notable careers and service. How can you stay fit in a busy workplace? I discovered UNT while on my college visits during the summer after high school graduation. UNT alumna Kristen Adele takes on many roles on, off stage. It occurred to me recently that almost-forgotten old campus haunts can be powerful memory stimuli. I have enjoyed reading about friendships and romances that were spawned on campus. UNT community marks reopening of UNT-International's new offices with dedication of a peace pole. UNT alumnus Ryan Davidson wins big honor from Canada's country music awards. In 101 years, 29 family members of the Hoke family have gone to UNT. Pulitzer Prize winning playwright Doug Wright serves as 2015-16 artist-in-residence at UNT. UNT alumni, leaders make Denton Arts Walk of Fame and Dallas 500. Plus, new University Union opens. Great start for Mean Green basketball; top punter; rugby teams score big. UNT alumnus Ignacio Torres wins fans with fashion photography. 125 Years of Holiday Cheer! See UNT's transformation through 125 years in this holiday video. The off-site instructional facility will give students and professionals essential career skills. Learn about UNT’s rich history in this interactive timeline.